Nordic Geo-Consult was established by an ambitious Geophysicist with 15 years experience in the oil & gas industry, namely; Mohamed Ali Matar. Matar commenced his career as a Seismic Data Processing Geophysicist with PGS in Egypt, progressed in his processing career till he became a Processing Supervisor at PGS Headquarters in Norway. For consecutive 8 years, Matar performed marine Seismic data processing for several projects, and managed all technical aspects/client communications for assigned projects as a certified Project Manager by George Washington University. Matar was a member of PGS global advisory consortium "SPT", standardizing Processing Workflows and Quality Procedures for the different processing techniques, to be implemented into PGS Quality Assurance system for ISO certificates. 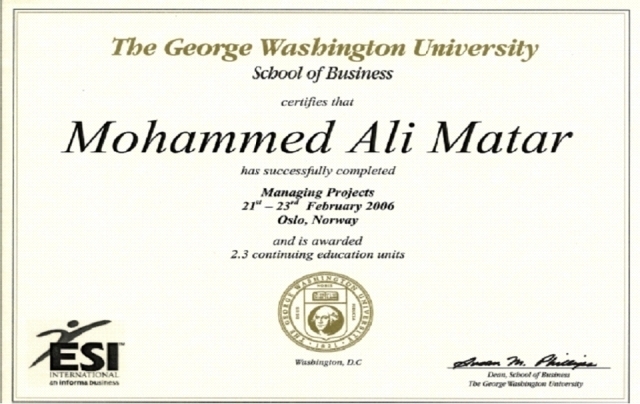 Photo: Project Management Certificate from George Washington University - School of Business. Photo: Seismic Processing Parameters Analysis and Testing course certificate. Photo: Presentation Skill Workshop Certificate. Taking a step further, Matar joined Schlumberger Norway Technology Center ''SNTC'', working as Geophysics Training Specialist, with main focus on implementing and developing Seismic interpretation and Velocity Modeling courses for Petrel, in addition, instructing various courses globally. Photo: Petrel Introduction Course Certificate. Photo: Petrel Seismic Interpretation Course Certificate. Photo: Advanced Seismic Interpretation Course Certificate. Photo: Petrel Structural Geological Modeling Course Certificate. Photo: Quantitative Seismic Interpretation Course Certificate. Photo: Train the Trainers Course Certificate. After that, he was assigned by Schlumerger as Territory Exploration Business Development Manager (East Africa & East Mediterranean Geo-market). Photo: Matar giving a talk during Schlumberger technology Forum in Egypt (2010). This event was organized by Matar and was attended by more than 270 Geoscientists from different oil & gas companies operating in Egypt. Photo: Sales Training Course Certificate. Shortly, he got promoted to cover the entire Middle East geographical area, as Schlumberger Regional Geosciences Technical Consultant. In this assignment Matar performed numerous Geosciences consultancy workshops for major oil & gas operators in the Middle East, such as; Aramco, Qatar Petroleum, PDO Oman and Kuwait Energy. Photo: Professional Rock Physics for Seismic Amplitude Interpretation (AVO) and Seismic Inversion Course Certificate - by Rob Simm. Photo: Schlumerger SIS Sales University - Technical Sales Course Certificate. 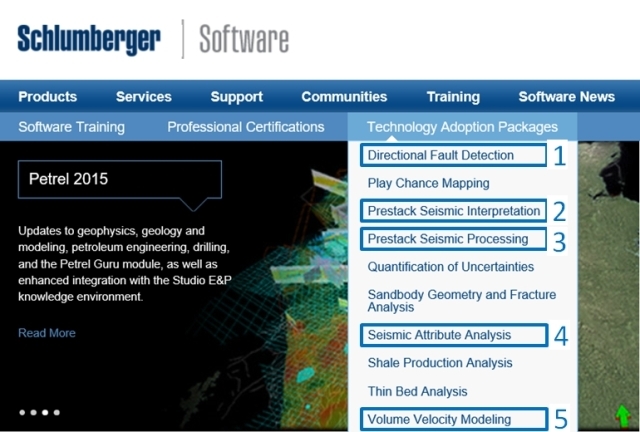 In 2012 Matar was called to join Schlumberger Headquarters in Stavanger (Norway) to grow Services business sub-segment, by implementing and developing Geosciences workflows in Petrel, for technology adoption purposes. In this role, Matar had an opportunity to consolidate and utilize the accumulated experiences to shape a Schlumerger Services product, branded and priced in Schlumberger products catalog, and called Technology Adoption Packages. Photo: 5 years service award from Schlumberger. After 8 years with Schlumberger, in 2015 Matar joined Dolphin Geophysical, as Manager, Scandinavia Seismic Multi-Client Sales. He managed the entire Seismic Multi-client Sales process, from lead generation & presentations, probing opportunities, up to negotiations and closure. In addition, followed several Multi-Client projects during Seismic Processing stage by Dolphin Processing departments in both UK and USA. Sadly, Dolphin Geophysical ASA could not sustain market position during the severe downturn, and filed bankruptcy in Dec 2015. Few months later, Matar established Nordic Geo-Consult AS with a clear growth vision to be a leading provider of different services to the oil & gas sector.